Residents who train at the University of Florida graduate with a solid set of clinical skills and the ability to practice anesthesiology in any setting they choose, whether private or academic. The board pass rate for our graduates is 93%, which is above the national average of 90%. Didactics are comprised of faculty-led lectures, online modules, and interactive Practice-Based Learning Discussions (PBLDs). PBLDs include oral board preparation, mock Root Cause Analyses, and case discussions. Friday morning case conferences feature timely discussions of recent interesting and challenging cases, and are often led by residents. One morning each week is dedicated to small group teaching with residents in each subspecialty meeting with faculty from that specialty. The CA1′s work as teams of two or three with a faculty mentor to present to their peers a chapter from their textbook, and the faculty mentor subsequently presents a related case to all residents. Visiting professors and journal clubs are a regular occurrence. CA1’s are also set up for success with a highly effective Basic Exam board review series from January – May. Mock orals are scheduled at least twice per year, often with members of our faculty who are real board examiners, with additional opportunities on various subspecialties and at the request of residents. Mock OSCE simulations are scheduled quarterly for senior residents to prepare for the OSCE component of the ABA APPLIED Exam. Individual 2-hour tutoring sessions with a former board examiner are provided by request for all seniors. Residents receive a generous Professional Development Allowance with additional financial incentives for superior performance on the in-training exam. All residents are encouraged to participate in the Gulf Atlantic Resident Research Conference, as well as other regional and national conferences with departmental support for travel. In 2019, we are hosting GAARRC at the Opal Sands Resort in St. Pete Beach, Florida. Residents also participate in research, patient safety and quality initiatives, and educational endeavors. We regard our residents not only as trainees, but as valuable contributors to our program and the care of our patients. Because UF Health Shands is a tertiary referral center for much of the Southeast, our residents regularly encounter patients with a multitude of medical and surgical comorbidities, many of whom are transferred to us because their conditions are out of the scope of practice at the referring facility. Pediatric cases such as congenital heart disease, congenital diaphragmatic hernias, and neurosurgical abnormalities. Complex vascular and cardiothoracic surgical conditions. Our vascular surgeons provide services ranging from simple dialysis access to complex endovascular thoracic aortic aneurysm stent grafting. Our cardiothoracic surgeons’ practice involves a large number of aortic and valve operations, and UF also serves as an active heart and lung transplant center. 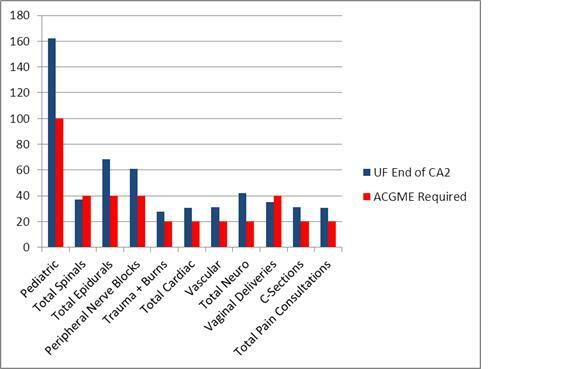 Early exposure to regional anesthesia and acute pain medicine beginning with a dedicated rotation their CA-1 year as well as multiple opportunities for regional procedures during their rotations at the VA. Basic TEE certification training and reading of exams is available to residents who desire to accomplish this during their residency. A unique Transition to Practice rotation is available to CA-3 residents, mimicking a private practice setting with CRNA supervision experience. By mid-way through their CA-2 year, most residents have reached all of their ACGME case requirements. Our current work hours average 54 hours per week. Call while assigned to the Main OR is one Saturday per month, leaving 3 out of 4 weekends free from work commitments. Weeknights are covered by a night resident. Each resident completes two of these 2-week “mole shifts” per year. Multiple moonlighting opportunities are available. Moonlighting opportunities exist where residents can work a 12 hour overnight shift doing OB anesthesia or a 6 hour Sunday day-time shift doing preoperative evaluations. In addition the Department often works graduating residents to design fellowships that meet their needs in areas such as neuroanesthesia, patient safety, research, and transplant anesthesia. For residents with a special clinical interest, subspecialty tracks are offered during the CA-3 year where up to an additional 6 months of training can be arranged in a selected subspecialty. We also can arrange a research track for interested residents, with 6 months of the CA-3 year dedicated to a research project guided by a faculty member. There are ample opportunities for research and all residents are given the opportunity to participate. The Department provides assistance, including an internal funding agency, an IRB/grant support staff, a statistician and a professional editor.